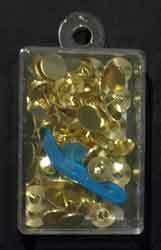 Box of 60 brass plated tacks perfect forr attaching canvas to stretcher bars. Plastic tack remover is included. Roll canvas tightly, do not crease. Place clips with saw teeth inside cylinder on each end. Stitch away! No More sore thumbs! Use the Corjac magnetic device for holding and comfortably pushing tacks into stretcher bars. 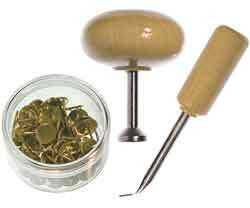 The kit also includes a box of steel tacks and an extractor tool to remove tacks when stitching is completed. This is the tool that tightens the EVERTITE STRETCHER BARS. It is great quality, and has an ergonomic “T” grip user friendly for those with arthritis, carpal tunnel, tennis elbow, etc. 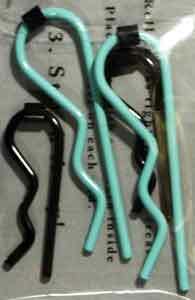 Stretcher bars that you can tighten as needed, without removing the tacks! Made of smooth durable wood, they have a center mark on each bar so you can quickly and easily line up and center your canvas. Best of all, they are adjustable 4 ways to eliminate canvas sag both vertically and horizontally. Adjustment is made with a tool, sold separately. Wooden dowels with 1.5" "easy-sew" corton twill tape glued and stapled to the dowels to prevent stretching and sagging. Dowels only - does not include wing nuts or knobs. Available in 9" - 34". Pivot arms for K's scroll frames. No hardware. 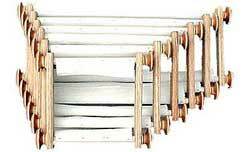 Includes one pair each of 7" side bars, 10" side bars and one pair each of the following dowels: 13", 16", 18", and 20". Eight black tri-knobs are also included. Side bars for K's scroll frames. Includes wing nuts. Standard scroll frame with 7" side bars and 9" or 13" dowels. Includes 4 easy turn black tri-knob. Standard scroll frame with 10" side bars and 16" to 34" dowels. Includes 4 easy turn black tri-knob. Includes 7" and 10" Ultra Lite side bars, one pair each of 6, 8, 10, 12, 14, 16 and 18" Ultra Lite dowels and 4 black tri-knobs. Includes 7" and 10" Ultra Lite side bars, one pair each of 6, 10 and 14" Ultra Lite dowels and 4 black tri-knobs. Dowels for Ultra Lite Scroll Frame. The first true lightweight scroll frame. The side bar is 1/2 inch thick, instead of the traditional 3/4 inch thick. Comes with 7" side bars and 1/2 inch diameter 6" long dowels with "easy-sew" 1.5" cotton twill tape, glued and stapled, and black tri-knobs. Keep needlework canvas secure while stitching. Most pieces worked on stretcher bars do not need to be blocked when finished. Stretcher Bars are great for mounting needlework canvas to keep it secure while stitching. Most pieces worked on stretcher bars do not need to be blocked when finished. Bars are 3/4" x 3/4" and come in a pair.